Here’s an easy and delicious recipe for braised oxtail, an often overlooked cut in the US. This recipe can also be made with bone in short ribs, but I hope you’ll take this opportunity to experience how tender and flavorful oxtail can be. Rinse oxtails and pat dry. Season liberally with freshly cracked pepper and salt. Seal them in a container and store in the fridge overnight. Heat oven to 450º F, with a rack in the upper third. Line a rimmed baking sheet with parchment, place oxtails on the parchment (not touching each other, give them space), and roast in upper third of oven until they are very well browned. Remove baking sheet from oven and put the roasted oxtails in a metal strainer/colander over a bowl (reserve fat in bowl). Let the fat drain into the bowl. Pat the oxtails gently with a paper towel to remove any more surface fat. Turn the oven down to 300º F, and move upper rack to the middle. Arrange oxtails in a lidded baking dish that just fits the meat. Using a spoon, scrape the fond off of the parchment and pour the fond and remaining fat from the parchment/baking dish into a small glass jar or container. Save this fat/fond in the fridge and use it to cook vegetables at another time. Make the marinade: mix together soy sauce, lime zest and juice, freshly cracked black pepper, plum preserves, a couple teaspoons of brown sugar, a slosh of dry sherry, scallions, ginger slices, garlic cloves, star anise, clove buds. Pour this marinade over the arranged oxtails. Top up the liquids with 4 oz or so of your home made (unsalted) beef broth (your oxtails should be about half submerged in the liquids, so adjust your broth accordingly). Tuck the whole lot into a parchment cut to fit the baking dish (this is best done by using the lid as a guide and cutting a half inch larger than the lid). Put the lid on top and bake in the middle of the oven for three hours. After three hours, turn up the oven to 450º F.
Remove the lid, remove the parchment, and return to the oven to reduce the liquids. You will need to watch that the sugars in the marinade do not burn. When the liquids are reduced, remove from oven and pour off the liquids into a glass measuring cup. Place the measuring cup in the fridge until the fat rises to the top and solidifies. Turn the oven off, put lid (not parchment) back on the roasting dish full of oxtails and return to the oven (this will keep the meat warm). Once the fat can be scooped off of the glaze, remove it with a spoon, then return the liquid to the oxtails. Make sure it’s all still hot and then serve. You can garnish this with fresh mint, cilantro, chives…whatever you like. Using 100% grass fed and pasture raised beef is a must. Chemicals and toxins accumulate in the fat cells, which makes eating animal fat from cows raised in unhealthy, unnatural conditions undesirable. Eating fat from grassfed, pasture raised animals that are not junked up on drugs and hormones is good for you. Please do not even think about making this delicious, rich and yes…fatty dish using questionable meat. This recipe is not for novice cooks. Not because it is difficult in any way, but because I’m leaving the proportions up to you and your personal taste. You will need to know the appropriate ratios of acid to sweet to fat in marinades. I bought a lovely looking preserve that was made from plum and anise. It’s made by McEvoy Ranch, and it is ghastly sweet. It was too sweet (for my taste) to use on toast or in any of the usual ways. But I found it is perfect for marinades and braises that can balance the sweet plum flavor. 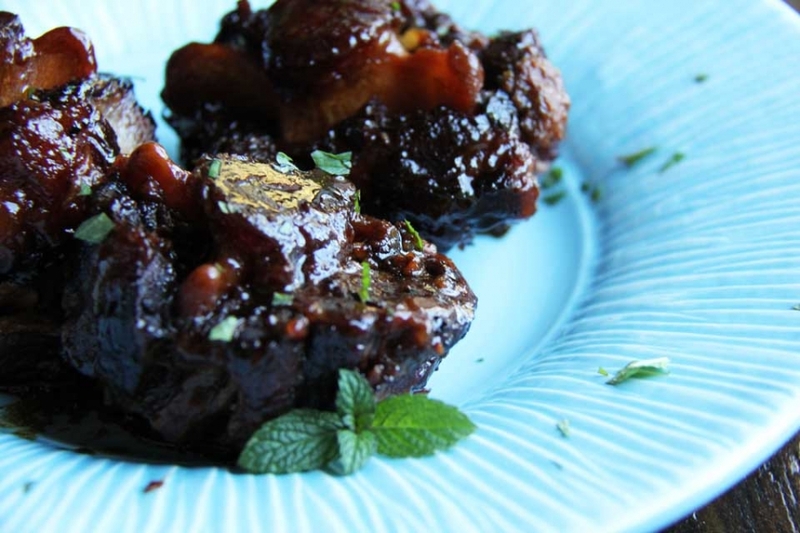 The very rich, intensely beefy flavor of oxtails is a good foil for the preserves. You can switch out the lime zest and juice for that of a tangerine or two. You can also add chilies or lemon grass, if you like. If you are not using freshly ground black pepper…stop! Yes, there is a huge difference. Similar to braised short ribs, these oxtails will actually taste much better the day after you cook them. So if you have the patience, you’ll be well rewarded if you cook the whole thing, pack it into the fridge and then heat it up in the oven the next night and enjoy it. You can add a couple spoons of beef broth when you reheat it to keep it optimally moist. Make sure you reheat it with the lid on so it doesn’t dry out. You can add a tiny bit (a couple of tablespoons) of freshly brewed lapsang souchong tea to the marinade if you like a smokey flavor.